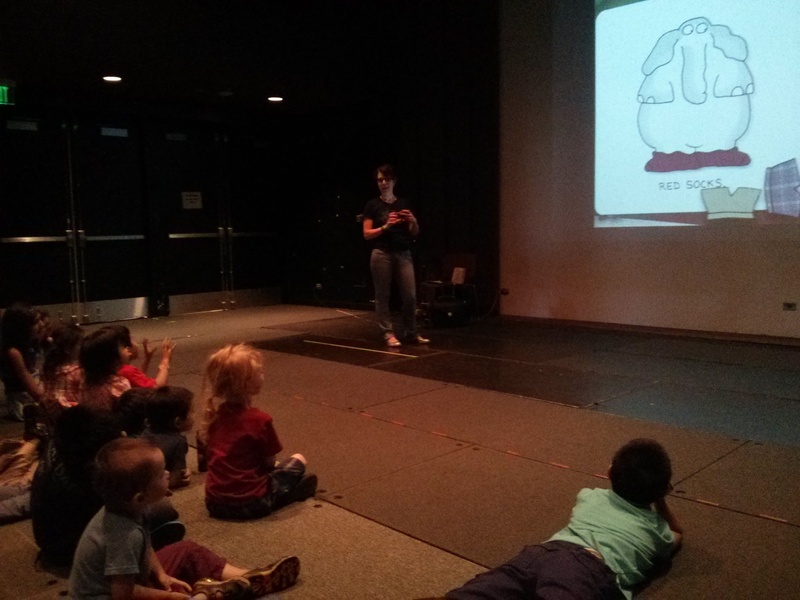 I got to do another Books on Screen New Media Storytime at the Children’s Discovery Museum of San Jose as part of their Storyland exhibit. I learned that a wireless network is NOT the same thing as wifi (in the internet sense) and thus if you set up a hotspot with your phone or what I lovingly refer to as my ZyXEL MWR102 Wireless router (MWR102 for short) and the apps that you are using DON’T require internet, you have enough mojo to keep the iPad and AppleTV talking to each other. Side note: you don’t need the AppleTV to sign into any network if you are directly connecting the wireless router to the AppleTV with an ethernet cable; you only need to make sure the iPad/iPod is connected to the router. VGA input does not include sound; if you are using an HDMI/VGA adaptor and mirroring through the AppleTV, the device assumes that sound is mirrored too, so you can’t use a wired audio connection. I need to get an optical audio cable to see if that works with the sound system in the museum. Nothing new in the app selection (it’s a new crowd every time, and it’s been so long since I did a program there!) and I was directing my energy to how I spoke to the parents about why and how we were using digital books with young kids. Hello everyone! My name is Cen and I’m a children’s librarian. I’m going to be sharing some books on this VERY big screen today, and we’re going to talk a little bit about new media & young children. How many of you have a smart phone or a tablet at home? [all hands went up] I’m going to be available to talk to you after storytime about apps & ebooks with young kids, and I’m going to share some digital stories with you today. You can check out the paper ones at your library! We librarians love recommending books, so if you’re interested in learning more about media & kids, take a look at Screen Time by Lisa Guersney & Born Reading by Jason Boog. I do want to point out that the American Academy of Pediatrics discourages the use of media for children under 2 years, and that we always recommend that you share all these apps together with your child. Posted on May 26, 2014, in Literacy. Bookmark the permalink. Leave a comment.